Is anyone else really frustrated with Crossfaith at the minute? For the band who are supposedly at the forefront of modern metalcore and not only survived the genre’s implosion in the early to mid-2010s but managed to thrive, they’ve sure been keeping their cards close to their chests lately. Bear in mind, Xeno was released in 2015, and while the music has continued to come, it’s been in the form of EPs which haven’t experienced much longevity beyond the initial hit. It’s clearly working for them though, because here’s Wipeout, another three-track EP that sees the Japanese quintet continue to do what they do best, that being metalcore with a slight electronic edge that’s one of the few examples of a band taking this template without it sounding dated. 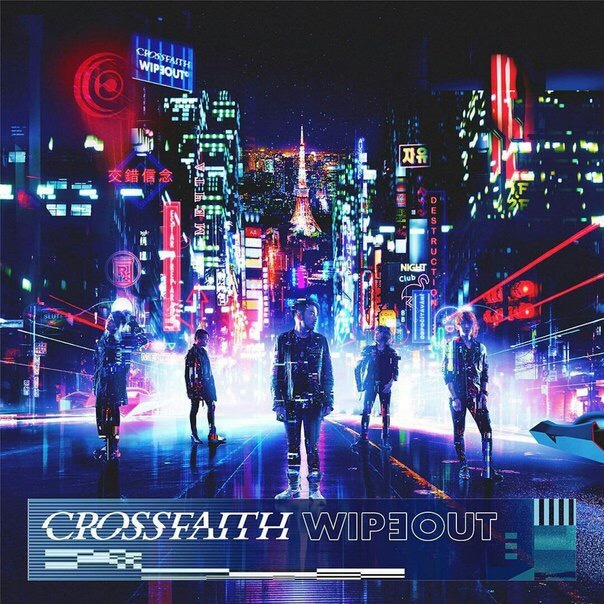 And maybe it’s something about Crossfaith that just manages to circumvent any major critical faculties, but Wipeout is the sort of typically riotous release that this band have long since specialised in. Again, it’s not pushing the envelope, and at just over ten minutes long this is little more than another aperitif, but Crossfaith have once again tapped into a well of contemporary metal that refuses to shake its fun factor. That remains the crucial factor here as well, because Wipeout sees Crossfaith shifting the focus away from the electronics and into more conventional metalcore, the first time since Xeno yielded its particularly underwhelming results. Wipeout, on the other hand, is a much better attempt, mostly because Crossfaith keep things as lean and potent as possible. Synth buzzes might flicker around the edges of the title track and Inside The Flames to hold that contemporary edge together, but for the most part, they’re reliant on a meaty instrumental section that’s really found some muscle and personality, and Ken Koie’s knack for a gut-busting chorus that’s always been his forte. As for Vermillion Gold, with Kazuki Takemura’s zipping guitar work trying to keep up with the keys and synthesised strings, it’s as convincing a case for Crossfaith to take themselves into power metal as you’re likely to get, and with the larger-than-life persona that’s already been established, it honestly wouldn’t be a bad fit. It just shows that, even when putting out a release as slight as this, there’s still something useful to be gleaned from new Crossfaith music. After all, anything from this band is good more times than not, and Wipeout is yet another EP that sits firmly in the “very good” catagory, held back from real greatness thanks, once again, to a rather paltry runtime. Still, another three good songs is better than nothing, and if the little and often release schedule that Crossfaith favour is going to continue, at least they’re giving us quality. ‘Wipeout’ by Crossfaith is released on 26th January on UNFD.